Are Your Managers Beach Bums or Strategists? I use the analogy of underwater diving to explain the types of strategic thinkers I’ve researched. 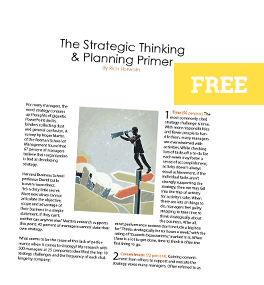 Just as there are four types of divers, so too are there four types of strategic thinkers. 1. Beach Bums: They sit on the shore and make no attempt to enter the water. This type of manager doesn’t contribute insight into the business. The research shows, on average, that 9 percent of managers are Beach Bums. 2. Snorkelers: They swim on the surface of the water, equipped with a diving mask and swim fins. This type of manager offers tactical solutions to issues, but the solutions don’t have a significant positive impact on the business. As the name indicates, they tend to do surface thinking and seldom get to the heart of an issue. Research indicates, on average, that 26 percent of managers are Snorkelers. 3. Scuba Divers: They swim underwater wearing a diving mask, swim fins, a wetsuit, and a portable apparatus containing compressed air. This type of manager can produce strategic insights for solutions but requires instruction and assistance to do so. These managers can provide ideas that advance the overall success of the business, but they need a setting such as a group strategic planning meeting to contribute. When these managers are thoroughly prepared with the proper data and market research prior to a meeting, and are then led through the meeting with frameworks and models, they can generate highly effective insights. However, because they generate insights only when heavily equipped, the insights are infrequent and tend to occur only in a meeting environment. Study results show, on average, that 32 percent of managers can be classified as Scuba Divers. 4. Free Divers: They dive underwater without the assistance of a portable breathing apparatus in an attempt to attain great depths. This is the type of strategic thinker leaders aspire to be. These managers generate effective insights about the business on a regular basis. Although they use a customary portfolio of questions, frameworks, and models to guide their thinking, they are able to summon the appropriate tool and combine it with the right data to continually generate insights that transform the business. The research indicates that, on average, only three of every ten managers are Free Divers. Consider your group: what percentage are beach bums and what percentage are truly strategic thinkers? *This post is based on content from the book, Deep Dive: The Proven Method for Building Strategy which can be referenced for further information.